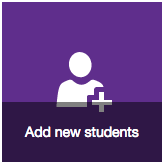 You need to add students to your notebook through the Class Notebook Creator web interface by clicking on “Add new students”, not through the OneNote program. If you share your class notebook with a student through the OneNote program, you can end up giving a student view or edit access to ALL of the sections, including those of other students. If this is something you’ve done already with a notebook you created with the Class Notebook Creator, it’s recommended that you un-share the notebook with all of your students and then add the students through the “Add new students” button on the Class Notebook Creator website. When students configure their Surfaces for the first time, two versions of OneNote are loaded, one that launches in the start menu and one that launches on the desktop. We (faculty) typically use the version on our desktop. The default on the students’ machines, however, may be set up as the start menu version. If you see a student who hasn’t properly opened OneNote in the desktop version, they can change the default to the desktop version easily using these instructions. Lots of helpful instructional documents are online on the Support Docs page. 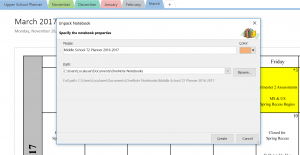 You can go directly to the Class Notebook Creator website by logging into www.onenote.com/classnotebook. Create an entirely separate notebook on your Surface in OneNote. Add a password to the section you’d like to keep private. Please note that this method is not recommended as we have had some stability issues with password protected sections in the past.